Description: The church of St. Walburga (Walburgiskerk) is a large gothic cathedral. The reverb time is enormous, ca. 8 seconds long. We spotted even up to 9 seconds on some tones. The church houses three pipe organs. The most important of them is the historical instrument of Hans Henrich Bader (died ca. 1680). The organ was constructed between 1637-1643 and it was placed on the northern side of the church at that time. 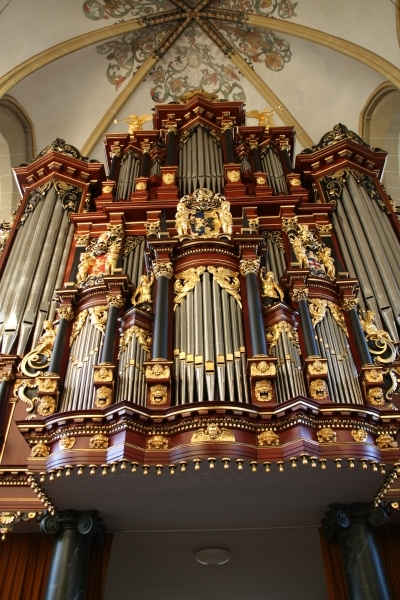 First, Bader was commissioned to add a Rugwerk to an existing older organ, later he added a new Hoofdwerk and a Pedal. The independent Pedal was a distinctive and innovative feature of the Westphalian organbuilding tradition Bader represented, since Dutch organs of the first half of 17th century lacked the Pedal division.